This is a sinful and super moist banana nut bread that makes all my intentions of dieting go out of the window. O.M.G I just need a big cup of coffee and a slice of this to make my foodie heart happy. The flavors on this banana bread are in full autumn vibes. Lots of cinnamon, nutmeg, roasted walnuts, vanilla, and banana. It’s the definition of a cozy dessert. How do you get the best banana bread? It’s quite easy once you understand the basic of baking a banana bread. The temperature: You need to get a consistent temperature during the entire process. This is especially crucial in the first 30 minutes of baking because this is the time frame where our baking powder is working to make the banana bread big and spongy. Do not open the oven before 40 minutes to check if it’s done. After that period of time, you can check with a wood stick to see if it is done. The reason behind this rule is that if the leavening agents —- in this case baking powder — is in process of adding volume to your bread and you change the temperature suddenly, you may end with a sunken center. The oven setting: I highly recommend that if you have a new oven that has a specific baking setting you use it. My oven has one and it’s amazing the difference that makes. It keeps the temperature even during the entire process. In case your oven doesn’t have this feature, try with the fan oven. This will help a lot. The mixing: The dough for the perfect banana bread needs a lot of air and some clumps in it. So, this time you won’t need that fancy hand mixer, just a spatula. In the main bowl, we mix the wet ingredients and then in another bowl the dry ingredients. The trick is to add slowly the dry ingredients and incorporate them slowly, folding the dough instead of beating it. It is important to be gentle with the dough. Overripe bananas: These are the star ingredient of this recipe. It is important that the bananas are ripe because they will be much sweet this way. I like overripe bananas especially. If you use overripe bananas you will get more moisture. For that reason, use 2 overripe bananas instead of three ripe bananas. 2 things: Oil + brown sugar. This is the winning team for a super moist banana bread. Brown sugar gives a chewy result. For that reason, I like to use a bigger proportion of brown sugar than of white sugar. It’s always a great idea to keep a little amount of white sugar to add structure to the banana nut bread. The extra oil will seal the moisture inside the banana bread when it’s baking. It’s vital that the type of oil/grease that you use is in liquid format. For example, if you want to swap for butter or for coconut oil just make sure of melting it before putting it into the dough. This will make the whole difference in moist. This is completely personal preferences. I love a splash of sweetened condensed milk and some crushed walnuts to decorate. It gives it a shine and a lovely look. 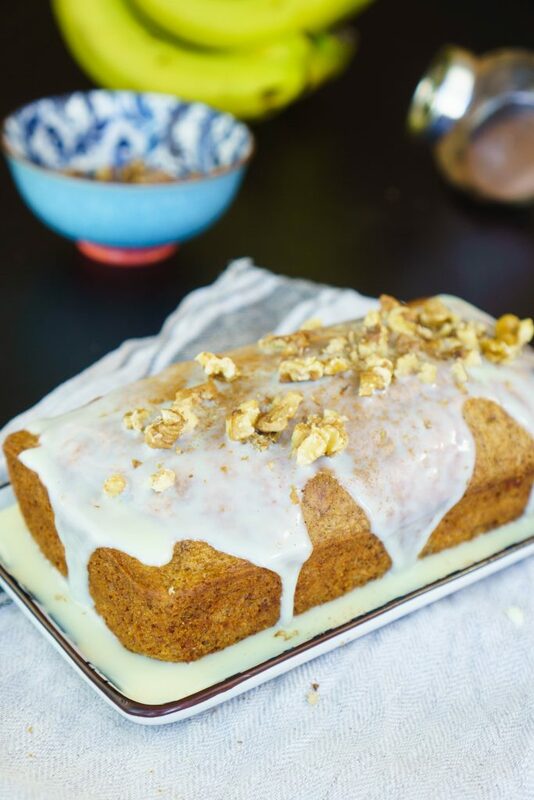 Can you freeze a banana nut bread? Absolutely yes! Wrap banana nut bread tightly with aluminum foil or plastic freezer wrap and you can store it in the freezer for up to 2 months. Now with all these tips and trick, this banana nut bread should be easy peasy to make. I hope you love this recipe as much as I do and I see you in the next one! In a big bowl mix the mashed ripe bananas, the eggs, the oil, the white and brown sugar, and the vanilla extract. In another bowl stir in the flour, the baking powder, the cinnamon, the nutmeg, and the salt. Slowly stir the dry ingredients into the wet ingredients and fold the dough gently. Toss the crushed walnuts and keep folding. Grease a bread pan and pour the batter. Take to the oven for 50 minutes. Let it cool. Serve and glace with the sweetened condensed milk and some chopped walnuts.